The challenge was to find a groundbreaking new approach to SickKids’ VS Campaign, because the organization is breaking ground on what amounts to a whole new SickKids hospital. When the Hospital for Sick Children (SickKids) was built 70 years ago, it was the largest paediatrics hospital in the world. The groundbreaking treatment continues, but the facility is showing serious signs of age. There are not enough operating rooms or space for the latest medical equipment, and patient rooms are in definite need of updating. The VS platform was launched in 2016, asking donors to join the fight against the greatest challenges in child health. The campaign was enormously successful, helping SickKids break their own fundraising efforts. This incredible success created an odd challenge. Because the hospital was seen as both government funded and a successful fundraiser, how could the team create an even greater sense of urgency, as SickKids’ fight is just beginning? The agency was tasked with launching the largest fundraising program in Canadian healthcare history. $1.3 billion is needed to rebuild SickKids and the VS campaign needed to evolve and ask people to join this new fight. For a job this big, the campaign needed to rally the entire city of Toronto, a city of individual neighbourhoods, behind the rebuilding of SickKids. In 1949, the entire city of Toronto rallied behind the construction of the Hospital for Sick Children. It was a massive community project that was only accomplished by bringing the entire city together to support it. The team now needed to rally the individual neighbourhoods of Toronto, which have distinct identities and a unique sense of community united in their love of Toronto: Leslieville, Leaside, the Danforth, the Junction, the Beaches, etc. Rallying these individual communities was the solution to uniting all of Toronto behind the organization once again. The SickKids VS fight was taken to the streets (and neighbourhoods) of Toronto. The VS campaign evolved to shift focus from the fight of the patients and doctors at the hospital to encourage all of Toronto to join this new fight to build a new SickKids. 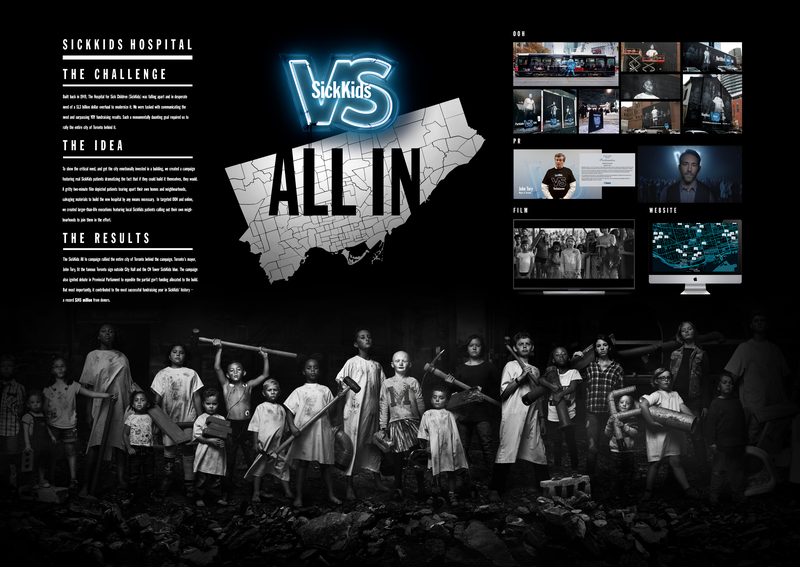 “ALL IN” was the rallying cry, and SickKids’ message was taken to the streets. The campaign and messaging was tailored to speak directly to the individual neighbourhoods that make up the city. The existing competitive spirit between Toronto’s neighbourhoods was tapped, and a call to action was issued for each neighbourhood to join in this fight (with a subtle challenge to see which ones would lead the charge). The campaign was launched with a gritty, emotionally stirring, 2 minute online film. The film showed Toronto’s kids (both sick and healthy) taking to the streets, working together towards a common goal. They rip apart abandoned buildings and even their own homes to salvage whatever building materials they can find. They rally around each other. The spot ends with a young girl placing a single brick on a new construction site. SickKids is breaking ground. The video drove overall awareness of this new fight to construct a new SickKids - and dramatized the sheer size of the task before the city, emphasizing why the organization needed Toronto to be all in. From there, the campaign was taken to the community level by creating different versions of the campaign for each specific neighbourhood. These individual campaigns not only called on that specific neighbourhood to join the fight, they also featured a SickKids patient that lived in the local area. Social media and email told the story of each child’s SickKids journey and were geo-targeted to the local neighbourhood they lived in. Wild postings and out-of-home murals featured call-outs to each local neighbourhood as well. Other city efforts included turning the CN Tower blue (SickKids’ iconic colour), lighting the Toronto sign at Nathan Phillips Square blue, and Mayor John Tory designating October 27 as “SickKids VS Limits Day”, all of which helped rally Toronto to be ALL IN for SickKids. The evolution of the VS campaign continues to help SickKids achieve incredible results. While the fight goes on, the organization is well on their way to achieving the goal of $1.3 billion. The team broke their own fundraising record by reaching $100 million in donations in a single campaign period. They saw a 54% increase in donations year-over-year (incredible growth given last year’s record-breaking fundraising performance), a 22% increase in website engagement YOY, and SickKids leads its sector in every measure of Brand Health. The launch film was tweeted every three minutes after its initial launch and the campaign overall generated 13M in media impressions.